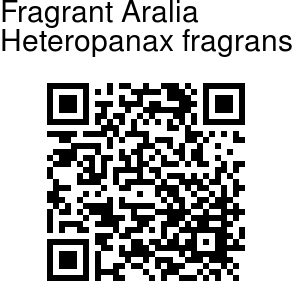 Fragrant Aralia is an unarmed, evergreen tree, up to 12 m tall. Trunk is branched only at the top, leafless below, main branches tri-chotomous. Leaves are hairless, about 1.2 m across, compound. Leaves have pairs of opposite leaflets at the nodes of the rachis. Leaflets are elliptic, about 5.5-13 cm long, 3.5-6 cm broad, with a short tapering tip. Leaves are slightly narrowed at base, hairless, not toothed, nerves not very prominent. Stalks of leaflets are 0-6.5 mm long. Fragrant flowers are borne in panicles 31-42 cm long, branches 10.4-16.8 cm long; umbels dense, sub-capitate in flower. Flower-stalks in fruit elongate to 6.5 mm or more. Fruits are much laterally compressed, 2-seeded, 6.5-8.6 mm, 3.5 mm thick, ultimately hairless and often glaucous. 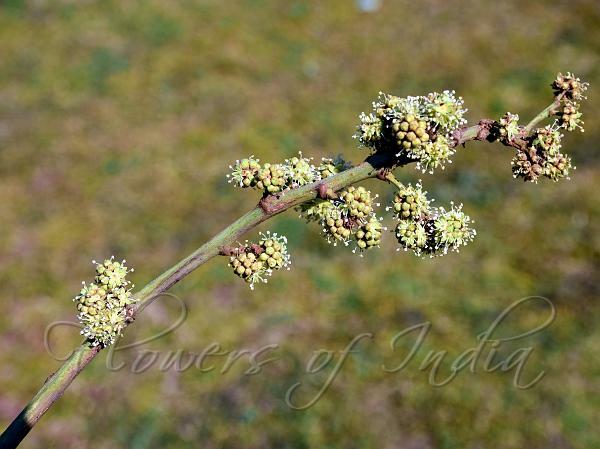 Fragrant Aralia is found in the forests of Eastern India. Flowering: October-December. Medicinal uses: Its roots and bark can also be made into medicine, which can be collected in the whole year. If they are dried, they can be used for detoxification, blood activation and detumescence, and pain easing. Identification credit: Jis Sebastian Photographed in Nagni, Chamba, Uttarakhand & Namdapha National Park, Arunachal Pradesh.